Marginalized artist groups located in Kyrgyzstan and throughout Central Asia. They connect with artists who are far from the capitals, who have limited market access, or who do not possess modern marketable skills but have carried on traditional craft culture. Following the proverb, ‘the best way to know a man is to walk a thousand miles in his shoes,’ it is believed that to know who we are working with and to understand their lives, we ourselves need to live like and with them. They live amongst their artist groups for an extended period of time, and during that time they help them become self-sustainable by developing their designs, management techniques, quality control and computer skills. 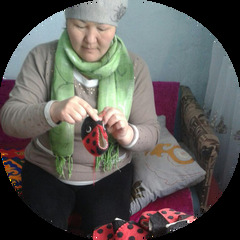 All designs and collaborations are original works of Central Asian artists.